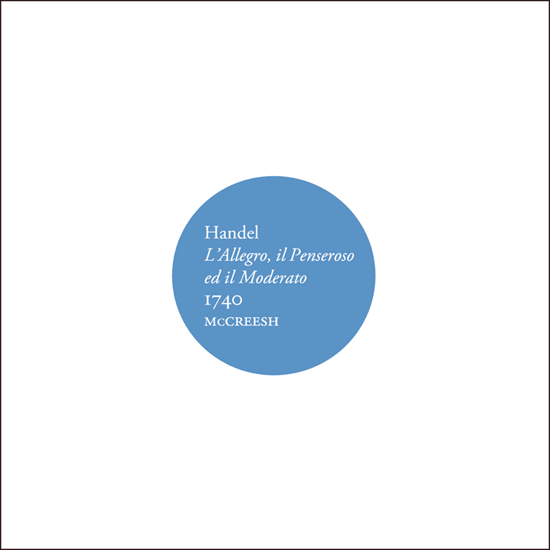 Handel’s L’Allegro, il Penseroso ed il Moderato is one of his most attractive and approachable, but also his most complex and confusing, works. It is not clear what it is. It is not an opera, an oratorio, ode or cantata, but was loosely described at the time as ‘an entertainment’. There is no plot, no human characters or underlying narrative. The title is in Italian, the text in English. The three ‘characters’ of the title represent the contrasting temperaments of mirth (Allegro) and melancholy (Penseroso), joined, in the third part, by Moderato, the voice of reason, restraint and, it seems, “chaste love”. Two of the ‘roles’ are each sung by three different voices (Allegro by tenor, boy treble and bass; Moderato by baritone, soprano and tenor), with Allegro on one occasion sung as a duet. The text was instigated by Charles Jennens (the librettist for Messiah), and is based on two poems by John Milton, something of a cult figure at the time. Milton’s poems are interwoven into a far from logical sequence of episodes in the first two parts before the third part introduces Moderato, to Jennens’ own rather awkward text. This CD is the first to be based on the first performance, early in 1740 at the Theatre-Royal in Lincoln’s Inn Fields; a version that was only given five times. It is a work that Handel returned to many times, revising it each time but, on the strength of this recording, it is clear that the format first performance was by far the best. It was aimed at a rather less cultivated audience than for Handel’s usual audiences. Ruth Smith’s impressive programme note delves into the background of the music. One of the things that attracted Handel to the text was the opportunity for musical contrast that it provided. Right from the start, the opposing character traits of the protagonists are explored (with a minimum of recitative to interrupt the flow of arias) starting with Allegro’s ‘Hence! loathed Melancholy!’ and Penseroso’s response, ‘Hence! Vain deluding Joys’. Rather than telling Moderato to push-off, the work concludes with Allegro and Penseroso (Gillian Webster and Jeremy Ovenden) joining in a gorgeously melodic duet (‘As steals the morn’), accepting Moderato’s pleas for “order, measure, time and place” and “due proportion”. There are many issues with the score and instrumentation of the first performance, which apparently included modifications from the already published music. The solutions offered here are all perfectly acceptable. Although there is rather loose contemporary evidence for the inclusion of a carillon in ‘Or let the merry bells rings round’, I’m certainly not complaining. We know that each part was introduced by an instrumental concerto’s (one being a ‘New concerto on the Organ’), but it is not clear which concertos these were. But the choices here are good, the opening jovial and bustling G major concerto nicely contrasting with the gloomy first recitative ‘Hence! Loathed Melancholy!’. The E minor concerto nicely reflects Penseroso’s more subdued mood. The Organ Concerto performed before the third part is almost certainly the Op 7/1 concerto included on this CD. It is a problematic work, the only one of Handel’s organ concertos to include a pedal part, despite there being little evidence of organs in England at the time having a pedal board (with the possible exception of St Paul’s Cathedral, which may not have had any independent pedal stops). Organist William Whitehead plays the rarely heard 2004 William Drake organ in Deptford Parish Church, based on pipework from 1745 and recreating a typical large parish church organ of that time. This is a substantial instrument and is probably larger than any that the Theatre-Royal could have accommodated, but it makes a splendid sound. Again, there are issues with the score, not least the frequent ad libitum instructions. William Whitehead comes up with elegant and appropriate solutions to all of these issues, playing with the sense of improvisatory vigour that must surely have featured in Handel’s own playing. He makes it clear that this is no ordinary Handel organ concerto by starting with a short improvised introduction, complete with pedal solo. Apart from ‘There let the pealing organ blow’, also played on the Deptford organ, the much smaller ‘Handel House’ chamber organ is used as continuo for the remainder of this CD, an organ far closer to that used for Handel’s oratorios and their organ concertos. As well as William Whitehead’s organ playing, there are many outstanding instrumental contributions, not least from violinists Catherine Martin and Oliver Webber, Katy Bircher in her delicious flute solo in ‘Sweet bird’ (track 1/17), Richard Bayliss, horn, notably in ‘Mirth admit me of thy crew’ (track 1/19), Christopher Suckling for his exquisitely fluid obligato cello in ‘But O! sad virgin’ (track 1/30) and Jan Waterfield and Paula Chateauneuf for their sensitive harpsichord and archlute continuo contributions. Vocally, the star performer has to be the (then) 15-year old boy treble Laurence Kilsby, making his last recording before his voice broke. He has an extraordinarily mature voice and obvious musical intelligence, although he has unfortunately already developed quite a prominent vibrato, something he may find difficult to learn how to control. Tenor Jeremy Ovenden brings a powerful presence to his contribution to Allegro, with wonderfully agile singing in ‘Haste ye, nymph’ (track 1/10) with its Ho-ho!’ twists and turns. Bass Ashley Riches adds a contrasting persona to Allegro. Baritone Peter Harvey provides a suitably measured voice for Moderato. Soprano Gillian Webster gives a powerful performance as Penseroso although, for my tastes, she includes far too many examples of a later singing style than that of Handel’s time. This included lifting onto the beginning of notes, portamento and a strong and rarely controlled vibrato. In her ‘But O! sad virgin’ (track 1/30) Gillian Webster shows that she is capable of sing a vibrato-free long note, and does so very effectively at the start. But the comparison between her singing of the complex and rapid ornaments with that of Christopher Suckling’s wonderful obligato cello reveal distinct differences in clarity, precision, articulation and fluidity. Conductor Paul McCreesh directs the Gabrieli Consort & Players with a compelling sense of Handel’s musical initiative, tastefully controlling the varying moods of the work. This CD was reco rded in three chunks (and three different venues), starting the day after their concert performance at Lufthansa Baroque Festival on 10 May 2013, broadcast on BBC Radio 3. There were further sessions in June and December 2014, but the engineers have successfully eliminated any evidence of the change of venue and acoustic. Before buying any CD I always check it out on Spotify. In the case of L’Allegro, my test piece is the achingly beautiful aria “As steals the morn”. I’m afraid my verdict in this case was: zero points. Soprano and tenor don’t balance properly with oboe and bassoon, being far too loud and wobbly. Even the choir is vibrato infected, as in the final chorus.